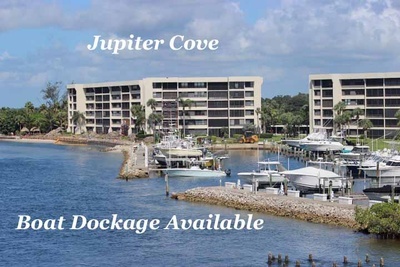 Jupiter Cove is a gated Intracoastal community consisting of 3 buildings and 138 condos. The 6 story buildings are located on the Loxahatchee River just minutes to the Jupiter Inlet. Jupiter Cove offers 2 and 3 bedroom 1,350 to 1,500 sq. ft condos with intracoastal and marina views. Jupiter Cove has their own boat marina with slips available for sale or rent. The proximity to Jupiter Inlet makes these boat slips quite valuable. Jupiter Cove condos all have great views of the intracoastal, Jupiter Lighthouse and overlooking Jupiter Harbour. Jupiter Cove offers tennis courts, a clubhouse and a heated pool. Browse listings for available Jupiter Cove condos, or Read more about Jupiter Cove condos in Jupiter, FL. The clubhouse of Jupiter Cove has a very nautical theme and represents the community theme. Parking is both covered and uncovered parking. There are no garages here. Jupiter Cove residents also have a small beach area down by the water on the West end of the property where you will find many owners enjoying happy hour and watching the boats go by. This is a popular area to meet other neighbors and relax after a busy day. They allow only owners to have pets up to 30lbs which is larger than many beach condos here in Jupiter. Rental restrictions are 90 day minimum like many condos twice per year. Located close to the beach, great restaurants, shopping, and boating, this community is a must see. Just a short walk to Jupiter Funky fishing village and Jupiter Riverwalk this community is a great place to live. Boaters come check out Jupiter Cove and the protected boat slips and proximity to the Jupiter Inlet. Jupiter Harbour offers boat dockage as well and is worth looking at. Located just as you enter Tequesta Jupiter Cove is on the other side of the Jupiter Inlet Bridge. Without having to cross the bridge you can find several nice restaurants such as Hog Snappers in Tequesta and a favorite of mine, Palm Beach Ice Cream. The Tequesta shops are being updated with new shops for better shopping and the Publix shopping center is a short drive away. Just a short drive North on US 1 you will find boat rentals at the marina as well as a nice waterfront restaurant. Cross over the Jupiter Island Bridge and enjoy either of the two beach parks or lounge around on the sandbar. See the views from the condos on Jupiter Island where many get ocean and Intracoastal water views. Singer Island condos have waterfront options with boat docks as well. You will find single family waterfront homes as well. If a Jupiter Cove Condo listing has caught your eye or you want more information about Jupiter, FL real estate, please don't hesitate to call 1-561-744-7025, or email via our handy contact form with any questions or to arrange a showing.